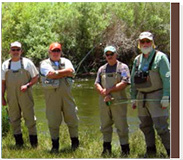 Bishop Flyfishing Guide Service covers waters from Bishop to Bridgeport, including the Lower Owens River, Upper Owens River, Hot Creek, East Walker, the Owens River Gorge and numerous creeks and lakes in the Eastern Sierra. 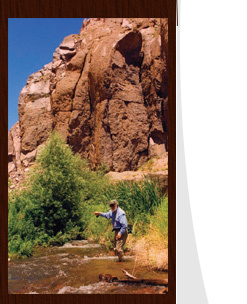 I offer wade trips and float tube trips, as well as drift boat trips down secluded sections of the Lower Owens River. Half day or full day trips are available. All equipment, gear and flies are provided in half or full day trips. Full day trips include lunch and beverages, half day trips include beverages. For your convenience all flies and equipment are included at no extra charge on any guided trip, class or seminar. Full Day trips include lunch Half Day trips include beverages. If you are interested in a Guide Trip, or if you have additional questions. Please fill out the form below. I will get right back to you. Looking forward to fishing with you.